Anything is Possible tells the story of the inhabitants of rural, dusty Amgash, Illinois, the hometown of Lucy Barton, a successful New York writer who finally returns, after seventeen years of absence, to visit the siblings she left behind. Reverberating with the deep bonds of family, and the hope that comes with reconciliation, Anything Is Possible again underscores Elizabeth Strout's place as one of America's most respected and cherished authors. 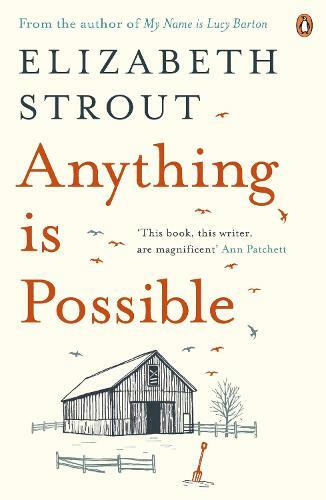 Born in Portland, Maine, Elizabeth Strout has spent her early life in New England before moving to New York. Justly considered one of America’s finest living writers, she won a Pulitzer Prize for her third novel Olive Kitteridge which was subsequently made into an award-winning drama by HBO. I was so grateful to receive an advanced reading copy of my current favourite author. Beautifully written, perfect little novel just as you would expect from this author. Really enjoyed delving deeper into the life of Lucy Barton.